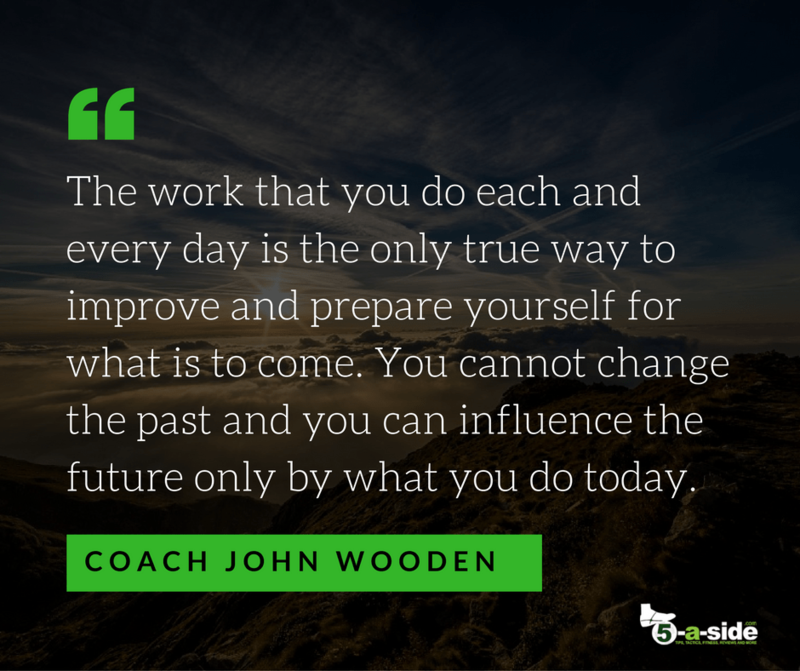 John Wooden (1910 – 2010) is indisputably one of the greatest sports coaches that ever lived. He is most widely recognised for his work as head coach of UCLA’s basketball team where he won ten NCAA national championships in a 12-year period, including a record seven in a row. That’s an incredible feat when you consider that this was achieved with an ever-fluctuating squad of players, as new ones arrived at the university and the more experienced ones graduated, some of them eventually progressing on to NBA stardom. Coach Wooden was himself an accomplished basketball player winning a national championship at Purdue. But it is his work as coach which will remain the stuff of legend for generations to come. If you’re in any doubt as to how impressive his seven consecutive NCAA titles are, consider that no other team has ever managed more than two in a row. 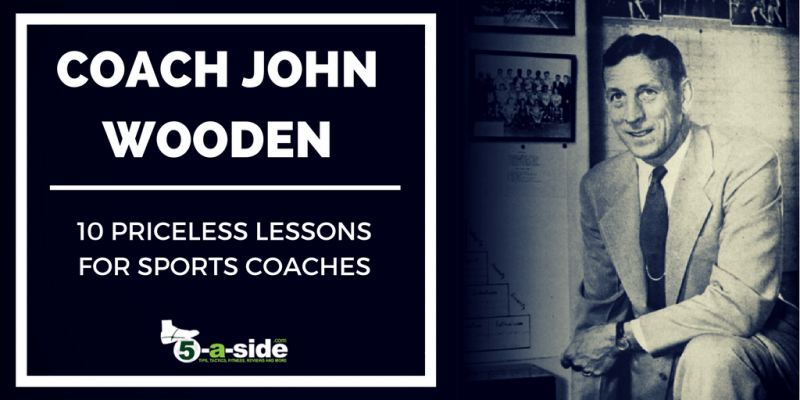 What made John Wooden arguably the greatest coach ever? It’s unlikely this was one single thing. Fortunately Wooden himself wrote and talked extensively about his key coaching principles, many of which formed maxims for success in life in general, not just on the court. Wooden left no magic formula for replicating his achievements, but did leave us with a wealth of insight into the methods and philosophy that underpinned it all. This article summarises the most important of these points, in an attempt to share the wisdom of this remarkable man. This philosophy is attributed by Wooden himself to his time as a player for Purdue University, where he was coached by Ward “Piggy” Lambert. Wooden may be best known for his work as a coach, but it’s often forgotten that he was an accomplished player, even winning the NCAA title as a student with Purdue University. It is no surprise, therefore, that conditioning became an essential pillar of Wooden’s coaching philosophy. He himself stated that if any one premise summed up his teams over the years it’s that they might be outplayed but they’d never be outworked. Although Wooden’s core principles for success in basketball can be traced back to his own coach, Piggy Lambert, both men differed on their techniques for conditioning their players. Lambert worked his players more in full-court 5 v 5 games but Wooden considered that he could achieve the same results with more 2v2, 3v3 and 5v5 half court games. This firm belief that the team comes before the individual was sacred to Wooden. Although he coached many college basketball players who would go on to become stars (most noteworthy, Kareem Abdul-Jabbar, voted by ESPN in 2016 as the second greatest NBA player of all time) there was no place for ego in the team. 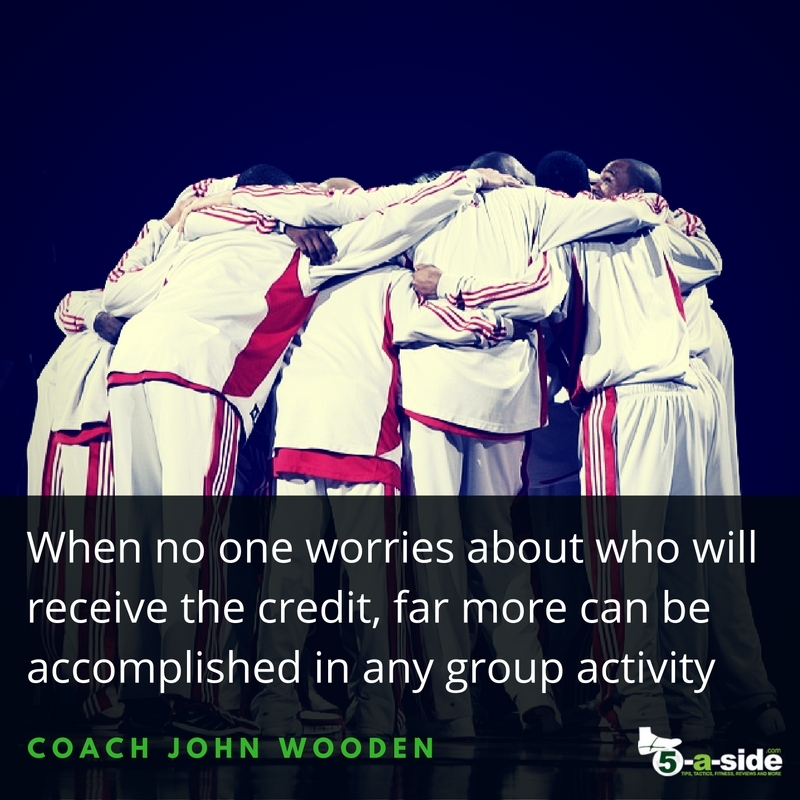 According to Wooden, individuals must prepare themselves to the best of their ability, but their talents must be applied to the benefit of the whole team. This definition sat at the very top of Wooden’s ‘Pyramid of Success’, a model supported by a number of attributes and characteristics that he regarded as the foundation of success (he even wrote an entire book on it*). Ultimately, however, his view was that personal success can only be judged by ourselves. Although winning was important to John Wooden, and it became something he became accustomed to, he carried the view that regardless of the result, his players had always won when they had done their best. Although Hollywood churns out sports movies with rousing, inspirational speeches, the reality of Wooden’s winning methods were much more prosaic. In fact, coach Wooden had a policy never to charge up his team on an emotional level. He believed that charging up his players was counterproductive, producing ‘artificial peaks’. And with each artificial peak, he believed that this was followed by a valley, and he was wary of such valleys as that’s where games can be lost. In terms of managing the spirit within the team, Wooden’s ideal is ‘an ever-mounting graph line that peaks with your final performance’. Practice was where Wooden felt he really made the difference to the team, and it’s unsurprising that this was taken incredibly seriously. Each morning Wooden and his assistant would spend about two hours together planning the day’s practice. The planning would sometimes last longer than the practice its self. After the plan was made, the notes for that session would be made on a 3 x 5 card that he carried in his pocket. Not only did this keep them accessible, but he could also jot down additional notes during the practice as things developed. After practice, coach would transfer his notes and the additional comments into his notebook. His notebooks were an essential part of his coaching toolkit, and he would make regular updates after games as well. Wooden was so meticulous in his note-keeping that he claimed he could tell you, even decades later, what they did at 3:30pm on a given afternoon. The view was that nothing helps players learn principles more surely than through actually performing and repeating them. The whole coaching profession in general could use this advice. More doing, less talking. Wooden notes that he rarely ever stopped the group to correct one player, as he considered this a waste of everyone else’s time having to listen to him correcting an individual’s specific mistakes. He did stop the group as a whole from time to time, but only where he was sure that the whole group would benefit from a particular point. For Wooden, the principles of hard work and enjoyment went hand in hand. To want to work hard at something you need to really enjoy it and he made sure that practices incorporated this principle. That said, Wooden did not permit larking around and would clamp down on showboating. He did not want players doing things in practice that he wouldn’t want them doing in a game. 8. Simplicity: why complicate something that is simple? John Wooden’s coaching philosophy was a simple one, and he believed that many coaches over complicate things. His view was that basketball is a simple game, so why make it complicated? Wooden wasn’t the sort of coach who would run very complicated patterns of play. His skill lay in his ability to distil the game down into key principles and methods and then ensure that his players master those basic principles better than other teams. 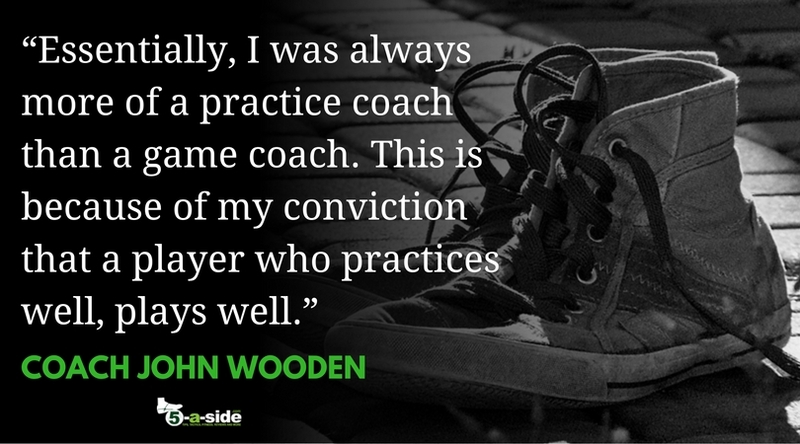 Coach wooden’s role went beyond preparing his players during practice and managing them in games. For Wooden, the role of coach extended beyond that, into all of the details around the team, and he personally made sure that they were dealt with. From the fitting of each player’s shoes, to making them all wear the same uniform to practice, down to instructing his players how exactly to put a sock on to avoid blisters, John Wooden’s attention to detail seemed far-reaching. Even if their warm-up suits didn’t fit correctly, Wooden would have them checked on each player and sent back until the sizing was right – he wanted them to look like a team and take pride in their appearance. Wooden considered that his love for young people is the main reason he stayed in coaching and refused more lucrative positions. 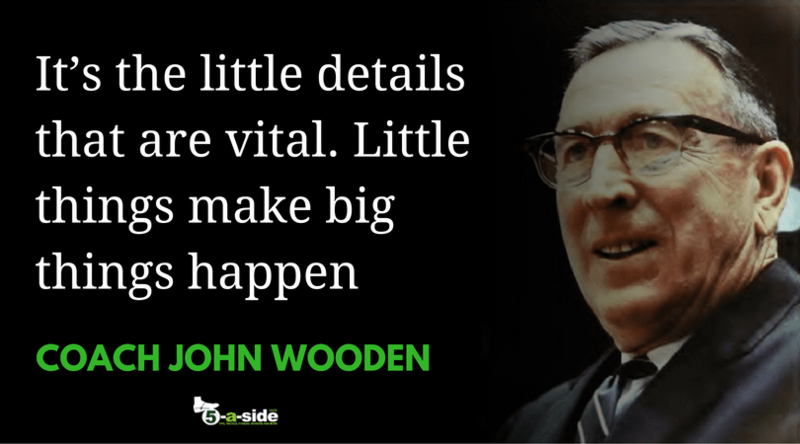 John Wooden is revered as one of the greatest coaches of all time. Winning an incredible ten NCAA national championships in a 12-year period as coach at UCLA is a marker that perhaps will never be repeated. Over that period of time, players came and went and Wooden was forced to dismantle and build several different teams, varying his tactics to bring the best out of each new group. His ability to reassemble championship teams, time after time, is testament to his extraordinary standing as a coach. This was no fluke. A man, a coach, a teacher, a mentor and a friend. 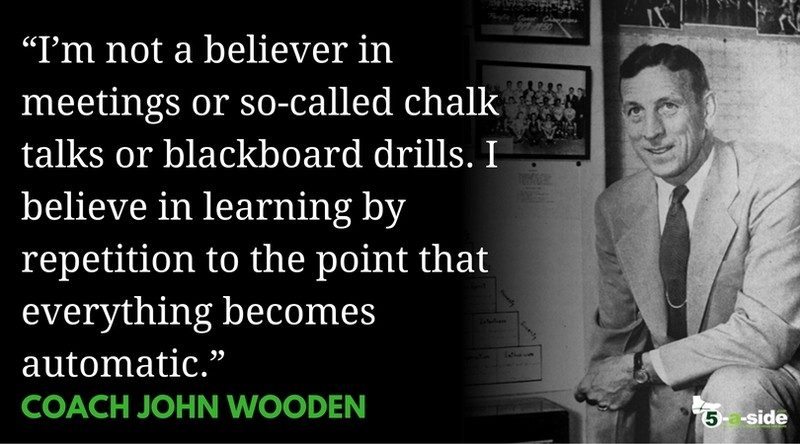 Wooden scaled incredible heights during his lifetime leaving lessons that we can all learn from. He showed that coaching isn’t just about tactics and shouting encouragement from the sidelines – it’s about developing players, and developing people. It’s about honest effort and preparation, and creating an environment that people want to be part of. We can all learn from that. Note: Much of the research and quotations for this article was sourced from the excellent book They Call Me Coach*, by John Wooden. It’s a fine read for anyone with any interest in coaching, or team performance – even if you’re not directly interested in basketball. Note: some of the photos in this article have been used under creative commons License from Wikipedia.